There’s a school in Stratham, NH, that, since November 2015 has had an array of solar panels on its roofs. The staff at the Montessori Cornerstone School were seeking to reduce their electricity bills, lower their carbon footprint, and put into practice some of their own teachings about respecting the environment and living in harmony with the world around us. Since 2015 the solar panels have produced 100% of the school’s electricity needs. But how do those panels work? And is solar only an option for larger buildings with big expanses of roof surface? The sun provides us with energy. When we’re exposed to sunlight, it hits us and its energy is converted to heat. That heat can be captured by solar heat collectors—typically large roof-mounted boxes with black interiors and glass-covered tops—and used to heat water in the home. But, once the sun has set, the heat is slowly but surely lost. A more sophisticated method of harnessing energy from the sun is to use photovoltaic cells, such as the crystals in solar panels. The atoms in the solar panel crystals are bound together by electrons. When the photons in the sun’s light make contact with these electrons the electrons become excited and move about, causing a direct current (DC) of electricity. The current is channeled out of the solar panel into an inverter, which transforms it from DC to AC, an alternating current, which in turn can power the common appliances of modern life. The AC power from a solar panel can be used in one of three ways: it can be stored in a battery for later use; it can be sent directly to an appliance where it is consumed; it can be fed into the grid. Solar panels can be installed on just about any flat surface that’s exposed to sunlight. The larger the surface area the more electricity will be generated but that doesn’t mean that a smaller roof is unsuseable, especially if the property remains connected to the grid to supplement its energy needs. What are the advantages? 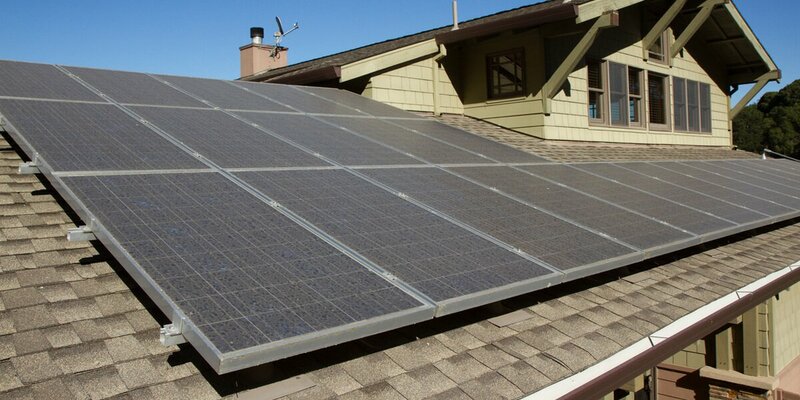 Once a solar system is installed and paid for, the electricity generated is free, clean, and environmentally friendly. You may not be able to generate all the power you need but even some solar power will reduce your carbon footprint and possibly your bills. To see how solar has affected the community at the Cornerstone School, click here.